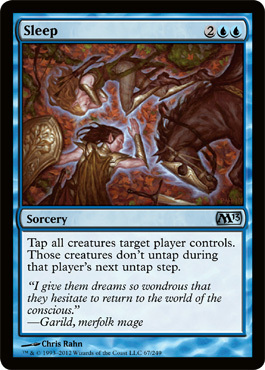 I’m almost done with my choices for cards I’d use during the pre-release on Saturday for M13. My friend has disagreed with me on a few of my choices, but that’s fine. I’ve only been drafting for pre-releases since M12 last year, so I’m not as experienced in drafting a deck for a sealed tournament as him. I welcome the input and hope that as I continue to play I’ll learn how to evaluate the value of cards in a set as well as him. I end up saying this whenever I post these articles, but this is just MY opinion. I’m choosing cards based on my experiences in the last 4 sets, trying to correct the mistakes that I made before. Hopefully I’ll do a little better at selecting decent cards today with my Blue selection. Take a look and tell me what you think, and as always feel free to drop in cards I didn’t mention or to let me know if you think a card is going to be crap. I’d like to hear your reasoning behind it so I don’t make the same mistake in the future when selecting cards. My whole strategy with Avacyn Restored was using fast, cheap cards. While I overwhelmed a lot of players early on, I fell behind when the games went long and they got out their beaters. I won’t make that same mistake again. Unsummon is great to clearing the path when there is just one creature left in your way, and it can also save you from death, at least for one or two more turns. Blue is all about timing, and keeping your card until it reaches it’s maximum value. If you’re running a quick aggro deck, this card will be key in dealing that lethal damage to finish off your opponent quickly. Some people might say that this card is a little heavy, but 2 2/2 flyers for 4 mana is pretty good value I think. 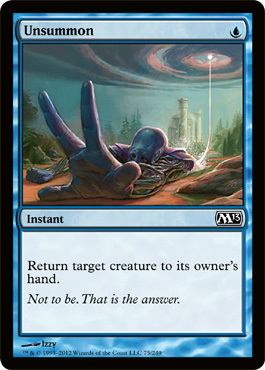 If you take into consideration that there are a few cards in blue that help you to return a sorcery or instant card to your hand, allowing you to cast this again, I think you will see the value there. 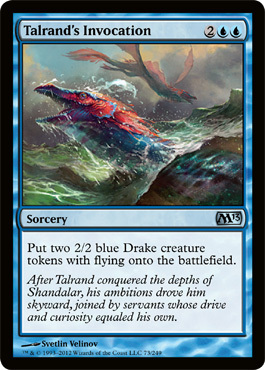 And if you pull a Talrand, you can cast this and put 3 2/2 Drakes into play. Flyers are never bad to have. I always liked this card. A little heavy, but it allows you to attack this turn without any worries of being counterattacked the next turn, and it can also help you stall the game. I think it’s definitely possible to run a decent control deck during the pre-release with the number of cards out there that will stall the game or remove them from combat. A black/blue exalted control deck that keeps attacking while tapping out your opponents creatures would be really effective. 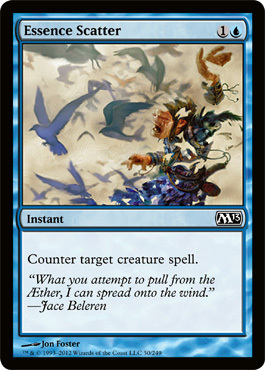 And if you manage to get a Jace out on turn 5 after playing this card? Your opponent will be really screwed and in danger of running out of cards. With most people only running 40 cards in their pre-release decks, this card can be pretty damn nasty. Two would be even nastier. 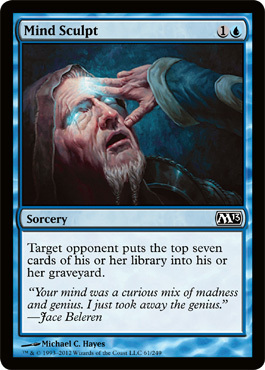 Great card to use if you pull one or two Jace’s Phantasm, Jace himself, or even one of the guys that returns sorceries to your hand. It works great with a control strategy as well, so keep it in mind as another way of winning the game! Also think of throwing some Mind Rot’s alongside it if you decide to play UB control. Again, if you’re going for a control angle, this card is great for you. He will keep you safe for the first few turns as you get your mana out and set up your defenses. 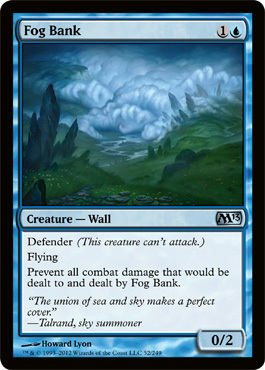 If you were to use white or black with blue, this guy wouldn’t be too bad with exalted if you needed to deal some easy damage or force your opponent to block with their only creature. This guy’s high toughness will ensure he survives anything short of Murder. Probably the best blue uncommon/non rare card in the set. 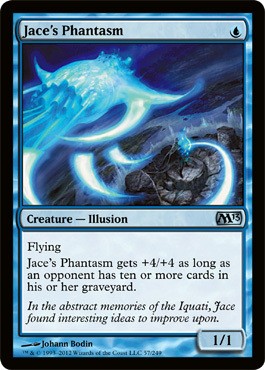 1 mana 1/1 flyer is great to have, and the fact that he can theoretically become a 5/5 flyer by turn 4-5 is awesome (if you have some Mindsculpts). I think no matter what deck you use, this guy should go in there, even if you have to splash in some blue mana for it. Totally worth having in your deck. This card will be EXTREMELY powerful in a sealed tourney. 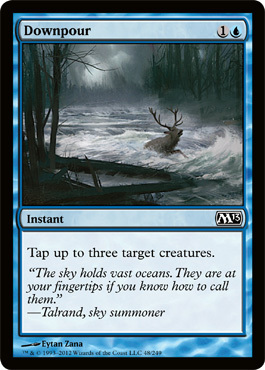 To be able to set up your next 5 turns assures that you won’t get mana flooded or will get the mana you need. 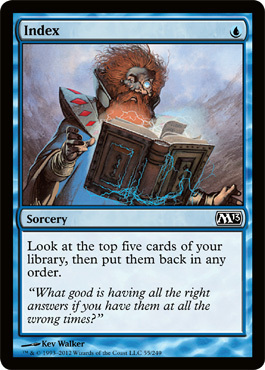 While it doesn’t let you shuffle your library if you don’t like the cards, nor draw a card like Ponder does, it’s still very useful to have in any blue/X deck you might be playing. 2 mana, flying, and can only be killed by removal like Murder . . . I like this card. It definitely fits in with a control deck, keep up your defenses alongside Kraken Hatchling while you mill your opponent away or slowly acquire the mana you need for a killer spell or creature. Creatures are incredibly important in sealed play. 90% of the time you’ll be losing the game to a 3-4 turn ‘beater’, or a biggish creature that you are unable to block against. I don’t know about splashing this in with a blue mana or two in a pseudo 3 color deck, but in a two color deck you should be running it. Just hold onto it until that crucial moment when your opponent decides to play their Sublime Angel or Vampire Nocturnus, and you’ll be glad you had it in your deck. This is SO much better than Ice Cage from M12 (which nobody ever used). I love that first line: ARTIFACT or Creature. It stops them from activating any abilities, and keeps them tapped no matter what. Short of a card that destroys enchantments, you slap this on a tapped card that has any activated abilities and it will be worthless for the rest of the game. 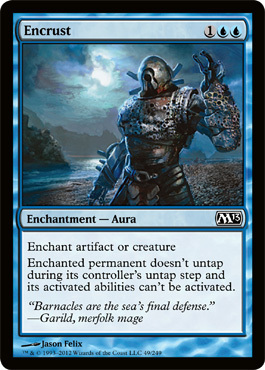 Great as part of a control deck, either UW or UB. Damn, just damn. There are SO many cards in blue that stop your opponent in their tracks it’s not even funny. Get your win condition out and just keep attacking/milling while your opponent stares at their cards turn on their side. 2 mana and an instant means that you’ll probably be using this on their turn PRIOR to their attack phase. Of course, if your opponent isn’t using that many creatures you might want to take this out, but like I said before I think most people will be hitting you as hard as they can as fast as they can. Taking creatures out of the equation and not having to worry about exalted will be great. 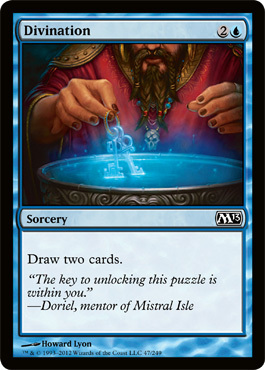 Guess they really don’t have any other cards that will let you draw in blue, cause this is the 3rd printing of it in a year. Good value on this card in limited and splashable in other decks to help you draw, so yeah, I’ll definitely be using this as well if I get it in a booster. With his ability along I’d play him for 2 mana, but he’s ALSO a 1/3??!?! Damn. I really like this guy. 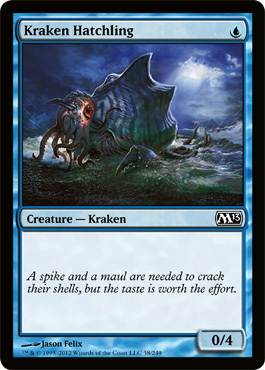 I definitely believe that the two big strategies for blue in M13 will be focused on disrupting your opponents by tapping their creatures, and also milling them into oblivion. This guy fits into just about any deck you could make. UB, UW, UG, UR . . . he’s gonna be a pimp, especially combo-ed up with an Index. 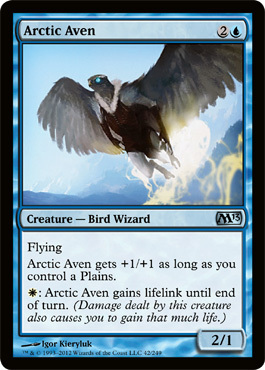 I learned how important Life gain was in the last pre-release for Avacyn and I won’t make that mistake again. This guy won’t reach his full potential unless you’re using UW, so think twice before putting him into another mix. Even if you splash a plains into your deck, it’s still gonna be hit or miss if he becomes a 3/2 or not. The reason why I like him is because you don’t see blue creatures with lifelink too often. But in all likeliness he’ll be in the sideboard that first game unless I’m running UW. The last card I think is good is Archaeomancer. He’s a more expensive Snapcaster Mage (except that he lets you keep the card in your hand instead of only giving it flashback until the end of turn), but with no Snapcaster in Sealed, he’ll be pretty damn useful. It’s really too bad you can’t blink him cause he would be very powerful. But he will allow you to use your Murder, Mind Sculpt, or Searing Spear again and just might save the day. Sleep: Tap all your dudes and alpha strike you for the win…don`t mind if I do. Switcheroo: you can have my Kraken hatchling and I will take your Serra Avatar….sounds good to me. 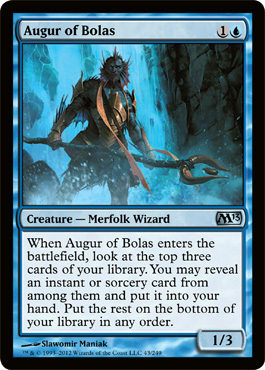 Augur of Bolas: Now where did I place those cards above me on the list…. Courtly Provocateur: You don`t mind attacking into my bigger creature do you? 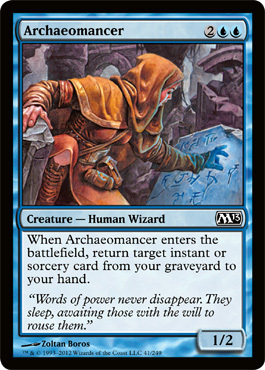 Archaeomancer: I need one of those top 3 cards back now to do more stupid stuff to you. Encrust: Soft removal that can turn off equip. Faerie Invaders: Flash, kill your dude, attack you. This is pretty much how I would rate the cards I would play in blue. Maybe switch sleep and switcheroo around, but those 2 are pretty close in power. I thought Switcheroo was good too, but I think it will depend how heavy my deck is if I will use it or not. If I have relatively low casting cost creatures, I don’t think it would be a problem, but if I’m using bigger ones, I might not use it. And LOL at Encrust . . . somebody wants to put a Sword of War and Peace on their creature, and you put that on it, letting them stare at it while you keep on attacking ^_^. Love that idea.